IMPERFECT TENSE and CHILDHOOD VOCABULARY: Answer 15 Questions in Spanish. This goes great with my https://www.teacherspayteachers.com/Product/CHILDHOOD-Extensive-Vocabulary-List-for-the-unit-on-Childhood-219327. 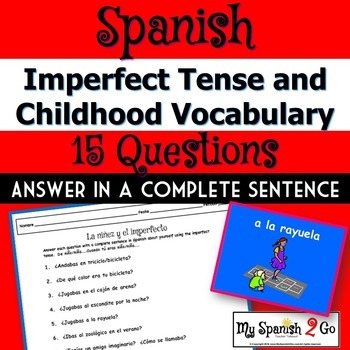 Students will answer 15 questions in a complete sentence in Spanish about their childhood using the imperfect tense.